Egyptians Hurry To Vote On Draft Constitution : The Two-Way Turnout was high Saturday morning at polling stations in several Cairo neighborhoods where Egyptians are deciding whether to approve their country's controversial draft constitution. Women wait in line outside a polling station to vote on a disputed constitution drafted by Islamist supporters of President Mohammed Morsi in Cairo on Saturday. Voter turnout on the first day of a referendum on Egypt's controversial draft constitution was so high in Cairo and nine other governorates that election officials decided to extend poll hours from 7 until 11 p.m. local time. Shortly after the extension was announced, the state-funded al-Ahram newspaper posted on its website the results from one polling station in the northern governorate of Dakahlia where 49 votes were cast. The newspaper says the constitution was approved by 55 percent of the voters. Further results from polling stations in the half of Egypt that voted are expected to come in overnight. But the Egyptian government says the official count won't be released until the other half of Egypt votes next Saturday in the final stage of the referendum. Such contradictions were widespread during today's vote, which has many Egyptians wondering whether they'll be able to trust what the Islamist-dominated government here announces as the outcome. Tempers flared in Alexandria, where The Associated Press reported that 1,500 women blocked a main road. The women were protesting a polling station judge they claimed prevented them from casting ballots because they weren't veiled. In a poor working-class neighborhood of Old Cairo, NPR reporters saw arguments break out at a polling station when a small group of voters planning to cast "no" votes claimed they were given ballots without official stamps on them, rendering them invalid. Turnout was high Saturday morning at polling stations in several Cairo neighborhoods where Egyptians are deciding whether to approve their country's controversial draft constitution. The Egyptian government claims the document — written mainly by Islamist politicians — provides a badly needed road map for the country. But opposition leaders argue the new constitution allows Islamic scholars to whittle away at the country's secular legal system and leaves too much power in the hands of the president and military. Just about all the voters we've talked to so far said they had little time to peruse the hastily drafted, 234-article constitution. For them, the vote was more about saying "yes" or "no" to President Mohammed Morsi and his Muslim Brotherhood. 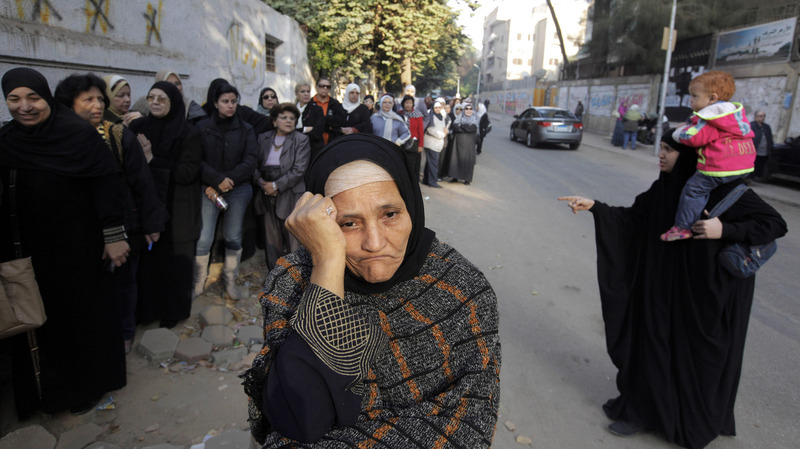 Some Egyptians were having a hard time casting ballots at all. They were sent text messages by election officials about where to vote, but when they showed up at those polling stations, the supervisors informed them their names weren't on the list. They argued to be let in anyway — to no avail. Another problem is that many judges who normally would supervise Egyptian elections are boycotting the referendum. They said they oppose the draft constitution because it was drawn up without a national consensus. The boycott forced election officials to split the voting over two days. There also aren't Western monitors observing the referendum to ensure it is credible. They were a visible presence during previous elections for parliament and the presidency. Westerners were invited by Morsi's government to return for this election, but declined. "You'd be walking into a situation where it would be very difficult to be perceived as neutral or independent," said Les Campbell, who is the Middle East and North Africa director at the D.C.-based National Democratic Institute. His group monitored Egyptian parliamentary and presidential elections over the past year. Campbell said it would have made more sense to delay the poll. "They shouldn't be trying to jam through a document that almost inevitably will be revisited within a few months anyway," he said. "This is just a power play, it's offending people, it's setting people off in the wrong direction. It's causing bitterness and they should pull back." Morsi's government claims that Egyptian law requires it to hold the vote now. The second and final stage of the referendum will be held next Saturday.